Hello reader! 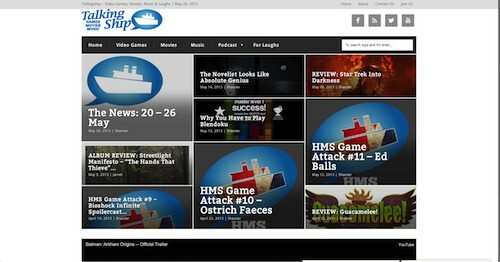 You might have noticed something new about Talkingship today. That’s right: we’ve gone and got a makeover. We think it looks rather fetching, don’t you? However, we understand you may be a bit flabbergasted by all this. Perhaps you don’t take kindly to change. So we’re going to walk you through the new site right here, and hopefully your worries will be put at ease. For a start, the homepage is strikingly different. We can now show you our 9 latest and greatest posts, with images, at a glance. That’s all thanks to what we’re affectionately calling ‘The Grid’ (it’s like the one from Tron, but better). If something catches your eye, just click it: you’ll be able to read the article straight away. That’s a theme running throughout the new site: if you see something you like, click it and you’ll be able to see more of it. Try it out with the category labels on each post! You might have noticed that there’s a special post in The Grid called ‘The News’. This is a constantly updating live blog that shows you all the latest gaming, movie and music news. So just keep that open in one tab on your browser, and you’ll never be more than a second away from instant newsy gratification. Right under The Grid is another great new feature: our video player. This contains a playlist of videos that we think you should see: whether it’s the latest game trailer, a hilarious viral video or something that we made ourselves, if we think it’s worth your time then you can watch it right from the front page. Press play to see the first video, and then click the playlist icon in the bottom right of the player to browse through our selections. The player is accessible on all devices: even iOS and Android. We’re really excited to be able to present our content not just in the written word, but in a great video format. Expect this to be full of funny videos. Last but not least, we’ve implemented a huge number of smaller changes. Posts look nicer and have slideshows, reviews have added functionality and scoring features, live blogs have been fully integrated and our categories have been honed down to create more focus. The entire site has been streamlined, and it should result in a better experience for you. As ever with a big redesign like this, there will inevitably be a few glitches here and there. If you do spot anything, let us know with our Contact Us page. We’ll greatly appreciate it, and you’ll help us to keep the ‘Ship in tip-top shape. So we hope you enjoy the new site. We have tons of great content coming over the next few weeks, including some fascinating interviews, thrilling reviews and live coverage of Microsoft’s Xbox Event tomorrow and all the E3 press conferences. Strap yourselves in folks: Talkingship is back, and it’s sailing better than ever. PS: We’re hiring. If you think you’ve got what it takes to join the crew, head on over here and register your interest. We’ll be in touch.